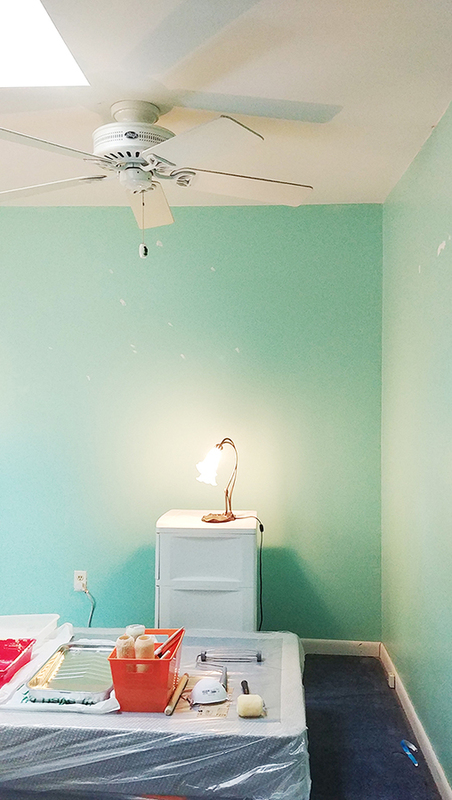 Sweet Sanity | When Is a Quick Room Fix Worth It? So often we find ourselves living in a space (or a whole home!) that is frustrating. 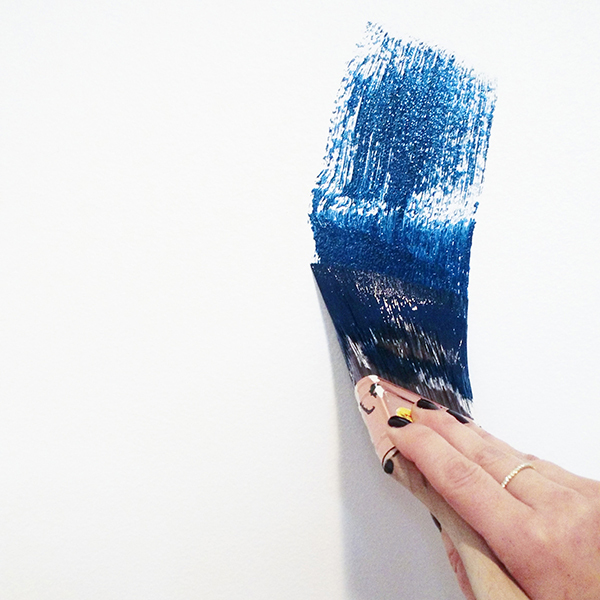 But whether we’re saving money for it, waiting for a strike of decorating inspiration or potentially moving anyway, it can feel confusing whether or not it’s worth fixing. So when is a quick room fix worth it? Years back at a time when I was stuck on some career and personal issues I worked with Lisa – Lisa the Life Coach I affectionately called her. She had a great sense of humor and always pushed me just outside of my comfortable zone, giving me really actionable advice. While we don’t work together anymore and are on opposite coasts, I still check in with her from time to time. Last Fall after moving to Virginia, I emailed her all the things that had changed for me at once, and which ones I thought I was struggling with the most. Her response highlighted one area in particular. MY SPACE. Of course I knew this wasn’t ideal! But our renovation would be underway any moment and I was excited for it. Couldn’t I just hang in there? I thought that line of logic could override the need for comforts on a daily basis or a little pretty nook to regroup. But the truth was that day to day I was not inspired or energized, which snowballed into the inability to start moving us out of this mess. I was aware that I didn’t have a good place to read, work, or re-center, but I hadn’t acknowledged how much it was affecting me. It was stopping forward motion. I knew she was right. I made a decision to pick a room, spend $200, and do it in a weekend. That amount of money and effort felt OK.
After walking around every room in our house I settled on the bedroom. 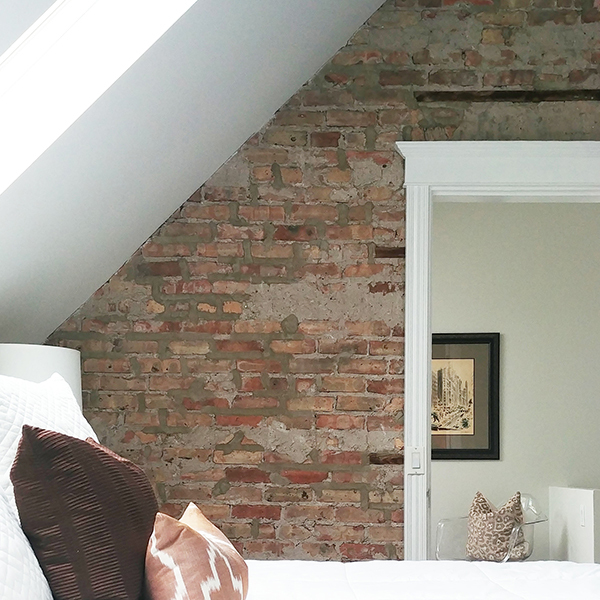 In Chicago, my bedroom was one of my favorite rooms. It was up in the attic and cozy warm even in the Chicago winters. I loved the vibe which felt peaceful and organized. In fun times I sat on my bed talking to friends and in tough times it still offered comfort while journaling or meditating. Even Toby loved it up there! Our bedroom in Virginia was far from this….so that was the one. I bought one gallon of paint in gray and one gallon of paint in white. Honestly, I didn’t even overthink the colors (which isn’t like me!). I used Benjamin Moore Coventry Gray which I’d done in a condo once before. Holes from old hanging posters or wear and tear scratches added to the visual messiness so patching those was the first step. It’s truly AMAZING what a fresh coat does and once you get set up it often goes more quickly than you think. I ordered a fresh white comforter on Amazon and went to HomeGoods for an accent pillow for the middle of the bed. I have a total throw pillow obsession and love linens and could forever dream up hotel-bed goals. But in this case something quick, fresh and low budget got me to a better place. Lighting does so much, as does some structure to what’s beside you when you go to bed. If your bed is also positioned towards the door it’s a little vignette you notice often as you pass by. 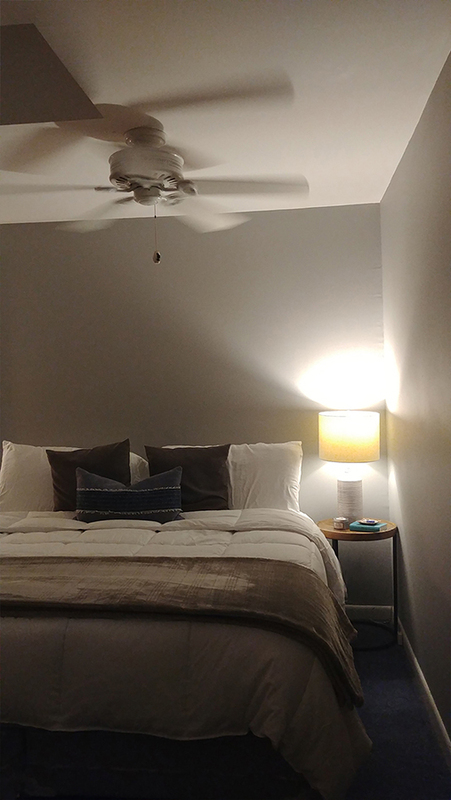 I replaced a tiny lamp with a taller one for reading, and added a side table (instead of my plastic drawers!) to house books and night items. $214. Could I have done more? Wallpapered, ordered furniture, done drapes? YESSSSSSSS. I am a recovering perfectionist… it’s hard to not want the Instagram feed photo. But changing it rather quickly to get out of paralysis even if temporary completely shifted the way we felt even the first night heading to bed. All that gave me a better chance of getting momentum on other things! So if there is a space bringing you down, shoot for a quick, easy, and impactful change to make you feel better and get moving. Go for it!